After much hunting and waiting, I finally had the good fortune to acquire one of the rarest and most sought after Minolta lenses, the 35mm f/2.8 Shift CA, a perspective correction lens. Coincidentally, within a few days I had also purchased a several other Minolta lenses in a bulk lot, including the 35mm f/2.8 MD W.Rokkor, and the well regarded 28-85mm f/3.5-4.5 MD Zoom. Together with my existing 35mm f/1.8 MD W.Rokkor this made four lenses that I owned that covered the 35mm focal length. I couldn't resist - I had to shoot a comparison. One of my favourite lenses, the 35mm f/1.8 MD Rokkor-X. How will it perform against its cheaper cousin, the 35mm f/2.8 Rokkor? The 35mm f/1.8 MD Rokkor-X is a compact, fast and high performing wide angle lens, and has been a constant companion when I have gone shooting. The moderate wide- angle makes for easy framing in street photography, and as a landscape lens the focal length is excellent. 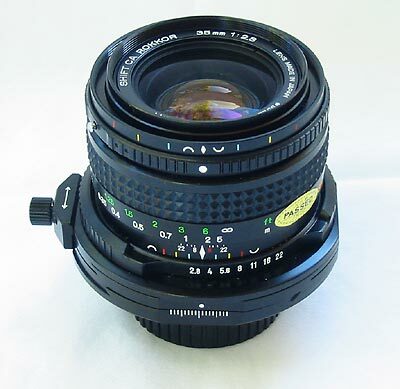 The lens is considerably rarer than the popular 35mm f/2.8 version, and a good example normally sells for approximately US$170 - $190 on eBay, and about $240 - $260 in stores. The 35mm f/2.8 MD W.Rokkor is compact, lightweight and inexpensive to replace if lost, making it great for any kind of travelling. The 35mm f/2.8 W.Rokkor uses a simpler five elements in five groups structure, in comparison to the f/1.8's eight elements in six groups, enabling a more compact size and lower build cost. As a result it sold for approximately half of the cost of the faster lens. It will be interesting to see if the extra elements in the faster lens provide better performance, as well as the better speed and brighter viewfinder. 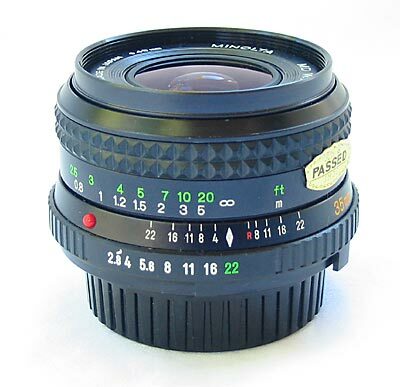 The 35mm f/2.8 is commonly available on eBay for between US$40 and $70, depending on condition. From a camera store expect to pay about US$90 - $110. The incredibly rare and highly sought after 35mm f/2.8 Shift CA. If you are looking for one of these, expect to wait a while! 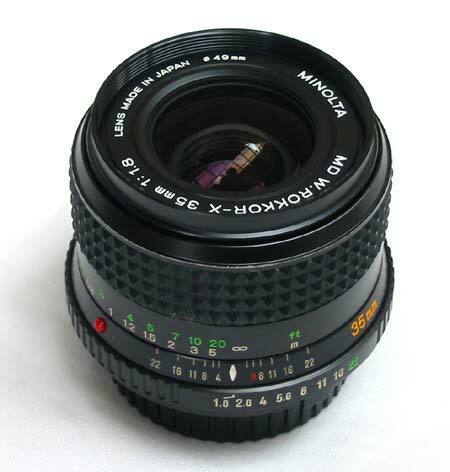 The 35mm f/2.8 Shift CA Rokkor is one of the rarest and most expensive lenses made for the Minolta manual focus system. The lens mount incorporates a mechanism that enables the lens to be shifted horizontally and vertically to correct perspective, a feature which is very useful in architectural photography, and vital if your output will be in an unmanipulated format (eg. transparencies for magazine use). Additionally, the lens has a variable field curvature ('VFC') feature, that enables the plane of focus to be altered to conform to the shape of the subject. Combined, these features make the 35mm f/2.8 Shift CA Rokkor unique in the photographic world. With a level of build quality which is truly outstanding, and a size more reminiscent of a medium format lens, the 35mm f/2.8 Shift CA is a very impressive lens to look at. On the camera, its performance and features are even more impressive, as not only is it easy to use, unlike every other perspective control lens it features an automatic diaphragm. It features a nine elements in seven groups design that naturally casts a much larger image circle than a traditional 35mm lens, enabling the lens to be shifted up to 11mm vertically and 8 mm horizontally. The 35mm f/2.8 Shift CA Rokkor is a highly sought after and uncommon lens and commands a high price whenever it is offered for sale. From a store expect to pay over US$900, and on eBay, or from a private seller, a price of US$750 or more is common. This lens naturally deserves a full review, which will be forthcoming after I have had an opportunity to use it at length. 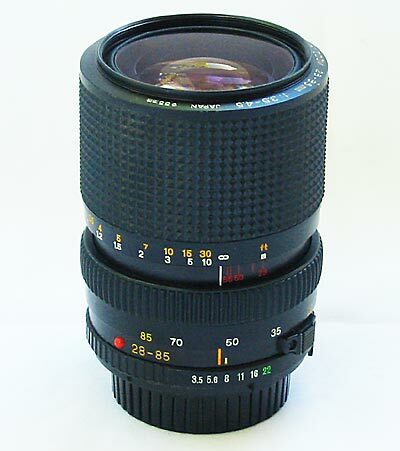 The 28-85mm f/3.5-4.5 MD Zoom is one of the most well regarded zooms for the Minolta manual focus system. Its convenient zoom range from wide angle to moderate telephoto makes it a popular choice. The 28-85mm f/3.5-4.5 MD Zoom was introduced to the Minolta line with the MD series of lenses in 1981. A sought-after zoom due to its very convenient 28-85mm focal length range, it was constructed with a 13 element in ten group design. As an added bonus, the lens also has a macro setting enabling close focus work at up to 0.25x life size. This is an extremely convenient feature, and makes the 28-85mm an obvious consideration for travelling. 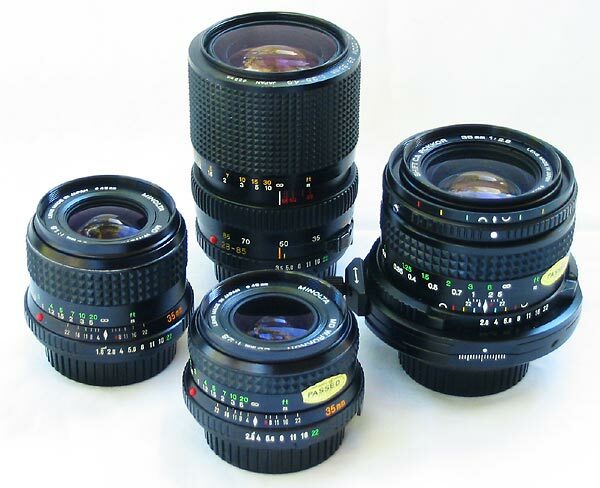 Zoom lenses, while very convenient for their ability to cover a range of focal lengths with one lens, normally have drawbacks when compared to traditional fixed focal length lenses. They are normally slower, are more susceptible to flare and reduced contrast, less sharp and can have higher distortion, particularly at the extremes of the focal length range. Accordingly, while excellent for general photography, many photographers seeking higher quality images capable of greater enlargement will choose not to use a zoom lens. It will be interesting to see how the 28-85mm f/3.5-4.5 compares to the primes to see if this holds true for this lens. The 28-85mm f/3.5-4.5 MD Zoom normally sells for between US$130 - $180 on eBay, and a good example in a store will normally sell for US$230 - $260, making it quite an expensive lens.